If you are lucky enough to have Scottish ancestry then tracing back your family tree to the early 1800's is something of a doddle. Go to http://www.scotlandspeople.gov.uk/ and you can search the registers of births, marriages and deaths plus a load of parish registers some going back to 1553. Mary is absolutely hooked and been doing wonderful stuff researching her family, both sides and my Dad's family. She has traced back my paternal line to my great-great-great-grandfather who married in 1817. 1. ARCHIBALD  MCLELAN He married MARRION MCDOUGALL 03 Mar 1817 in Bowmore. She died 24 Aug 1857 in Victoria Street, Govan. 2. i. DOUGALD  MCLELLAN, b. 07 Dec 1818, Inchinan, Renfrewshire; d. 12 Jan 1875, Coatbridge. 2. 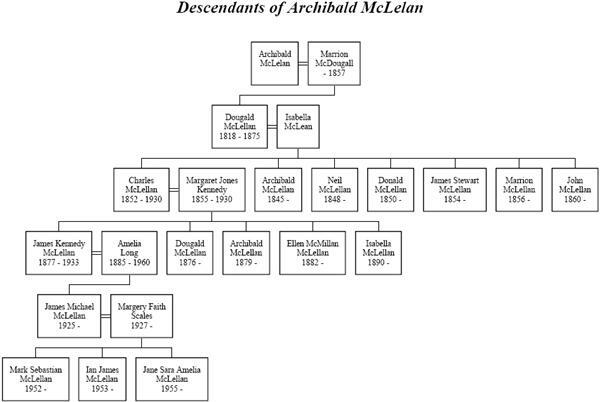 DOUGALD  MCLELLAN (ARCHIBALD  MCLELAN) was born 07 Dec 1818 in Inchinan, Renfrewshire, and died 12 Jan 1875 in Coatbridge. He married ISABELLA MCLEAN 22 Apr 1845 in Barony (Maryhill), Glasgow. She was born in Tyree, Argyll. 3. i. CHARLES  MCLELLAN, b. 09 May 1852, Gartsherry, Coatbridge; d. 17 Oct 1930, Tollcross Road, Glasgow. ii. ARCHIBALD MCLELLAN, b. 10 Jul 1845, Gartsherry, Coatbridge. iii. NEIL MCLELLAN, b. 11 Jun 1848.
iv. DONALD MCLELLAN, b. 09 Jun 1850.
v. JAMES STEWART MCLELLAN, b. 16 Jul 1854.
vi. MARRION MCLELLAN, b. 19 Jul 1856.
vii. JOHN MCLELLAN, b. 07 May 1860, Gartsherry, Coatbridge. 3. CHARLES  MCLELLAN (DOUGALD , ARCHIBALD  MCLELAN) was born 09 May 1852 in Gartsherry, Coatbridge, and died 17 Oct 1930 in Tollcross Road, Glasgow. He married MARGARET JONES KENNEDY 06 Dec 1875 in Old Monkland, Lanark. She was born 06 Jan 1855 in Sunnyside, Coatbridge, and died 22 Sep 1930 in Tollcross Road, Glasgow. 4. i. JAMES KENNEDY  MCLELLAN, b. 26 Dec 1877, Coatbridge; d. 1933.
ii. DOUGALD MCLELLAN, b. 22 May 1876, Coatbridge. iii. ARCHIBALD MCLELLAN, b. 03 Aug 1879, Coatbridge. iv. ELLEN MCMILLAN MCLELLAN, b. 16 Jan 1882, Coatbridge. v. ISABELLA MCLELLAN, b. 05 Jun 1890, Coatbridge. 4. JAMES KENNEDY  MCLELLAN (CHARLES , DOUGALD , ARCHIBALD  MCLELAN) was born 26 Dec 1877 in Coatbridge, and died 1933. He married AMELIA LONG. She was born 1885, and died 1960.
i. JAMES MICHAEL5 MCLELLAN, b. 10 Mar 1925; m. MARGERY FAITH SCALES; b. 27 Apr 1927. Do you have any more info on Dugald (2) McLellan? Dear anonymous Dougald  Mclellan descendant.